I’ve been trying to slow things down a bit lately. The intense stress level at work (planing 3 big theater premiers in 3 weeks), combined with the pressure to whip something new up every fortnight are beginning to take its toll. 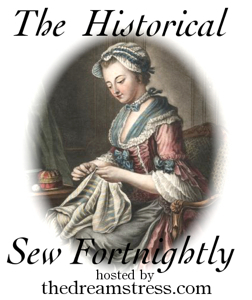 I’m always tired and have lost some of the joy I’ve used to find in sewing. I realize I need to slow down and let some of the self imposed pressure of my back. So for the first time I’m actually proud to admit I’m late finishing the HSF nr 17 – Yellow. (and probably will be late with a couple more upcoming challenges this fall). Anyhow here is the write-up on the challenge. 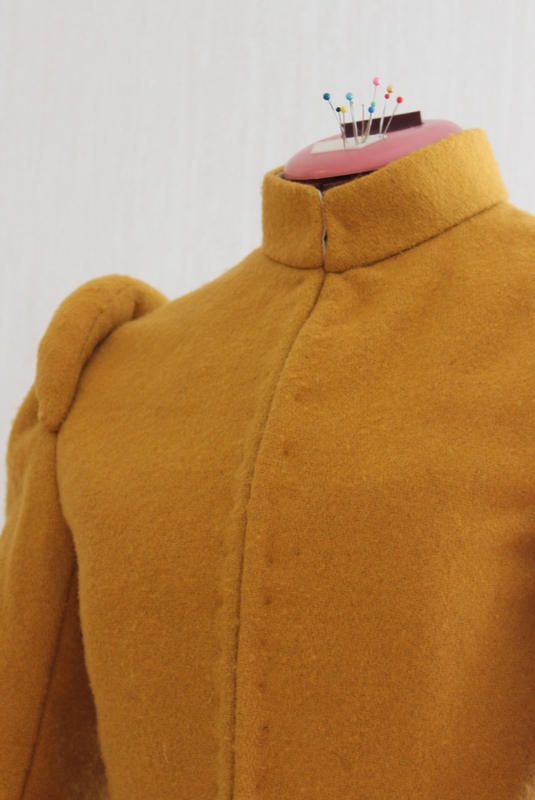 I had several alternative ideas for this challenge (regency spencer, open robe or pelise just to mention a few), but the moment I found this lovely yellow wool at the medieval fair, I knew exactly what I wanted to make. 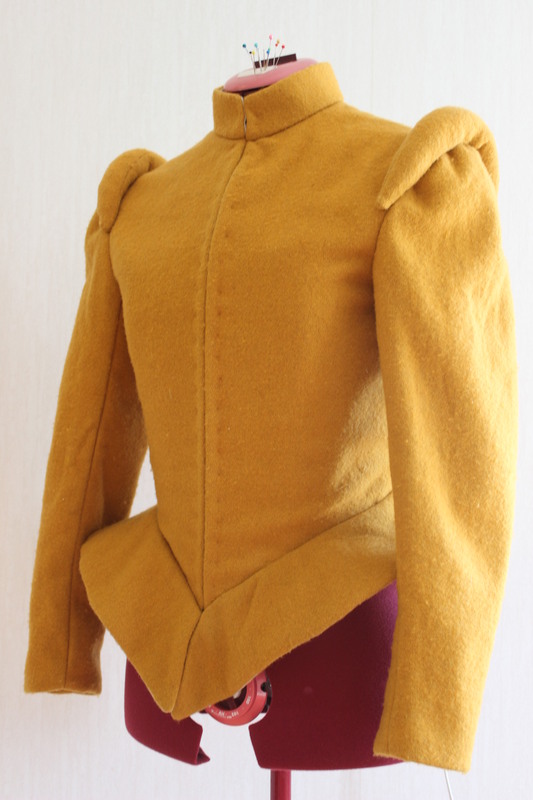 A 16th century Doublet. 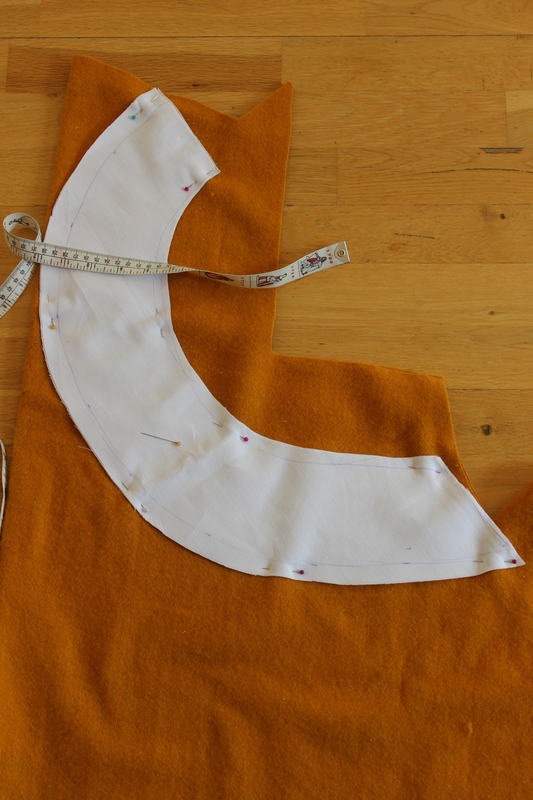 Pattern and design idea from “The Tudor Tailor”. 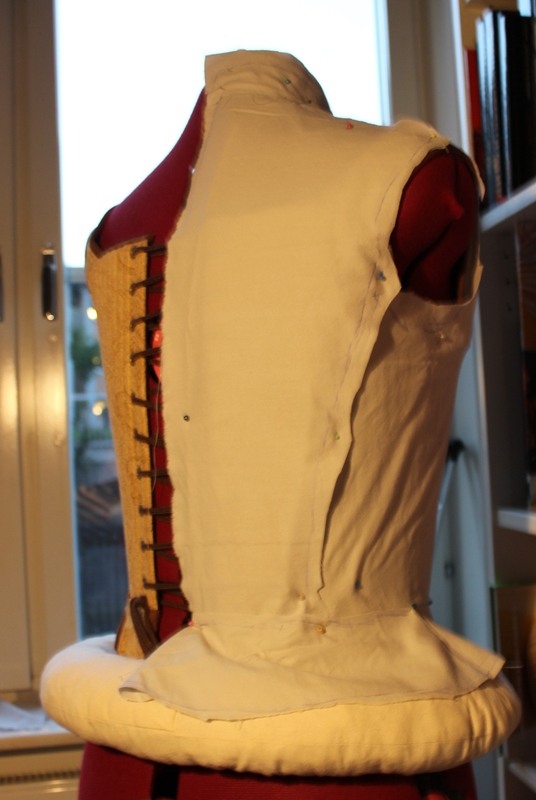 So I put my Elizabethan corset and bum-roll on my dress-form and started to work on the pattern. 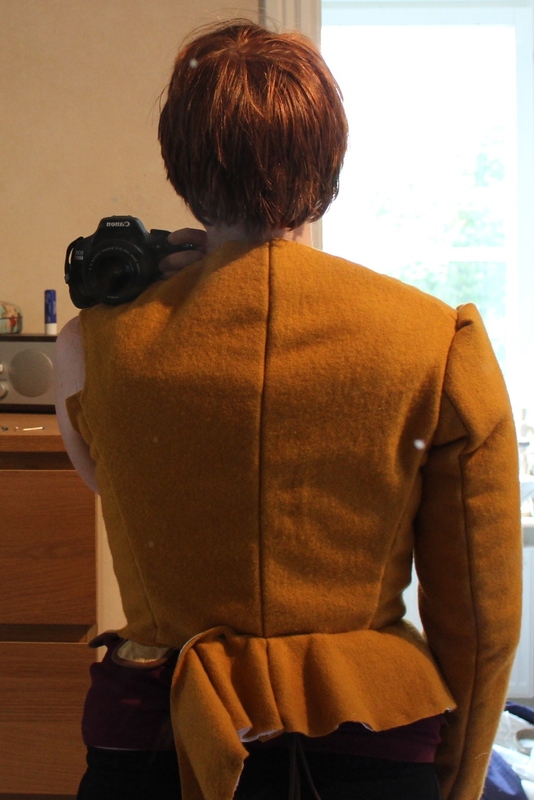 I needed to take it in a bit at the center back and make some smaller alteration to the collar. 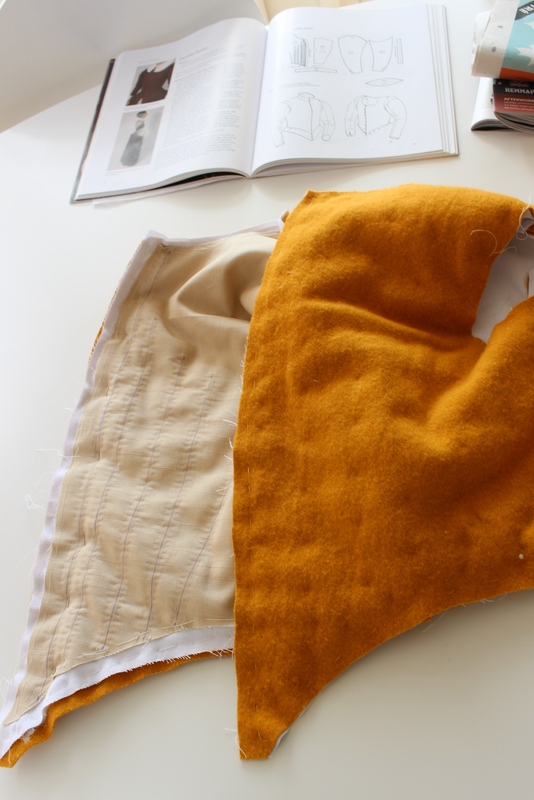 Then I cut the pieces in cotton (for lining) and the yellow wool. 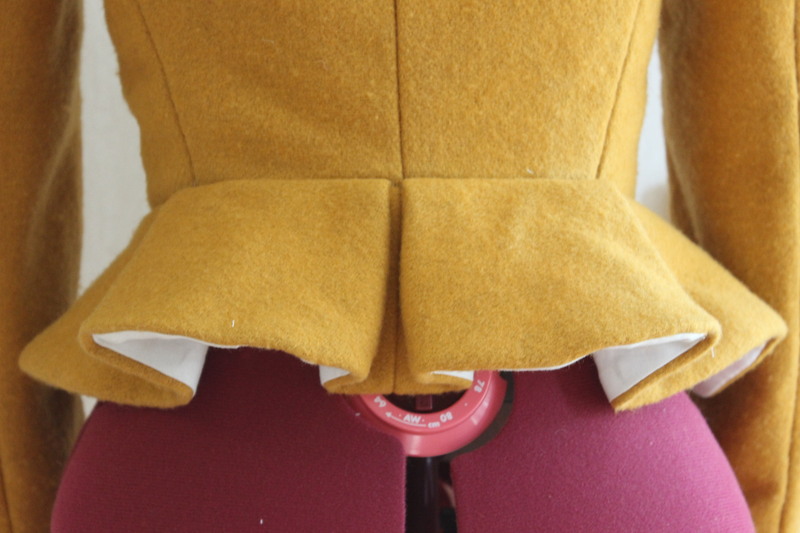 The piece for the peplum was basically a semi circle. 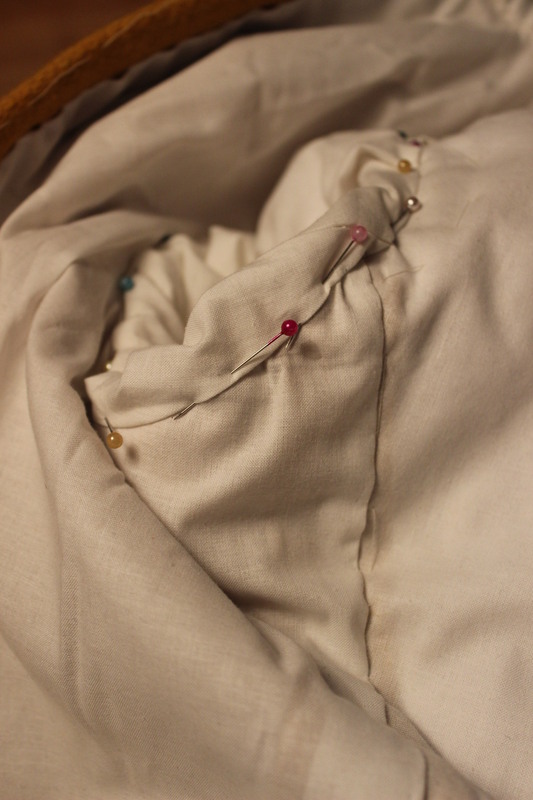 Then I cut and pad stitched wadding to the front pieces. Unfortanly the minimal stitches shows through as small dots on the outside. 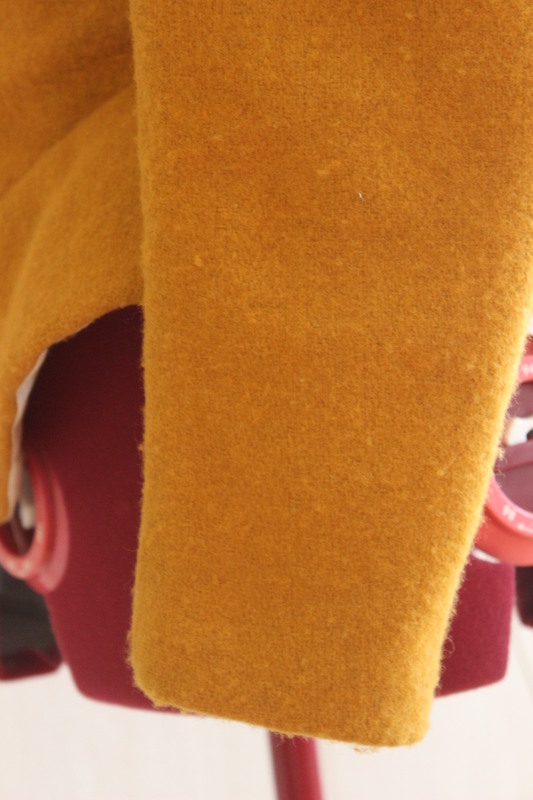 Close-up of the stitches. 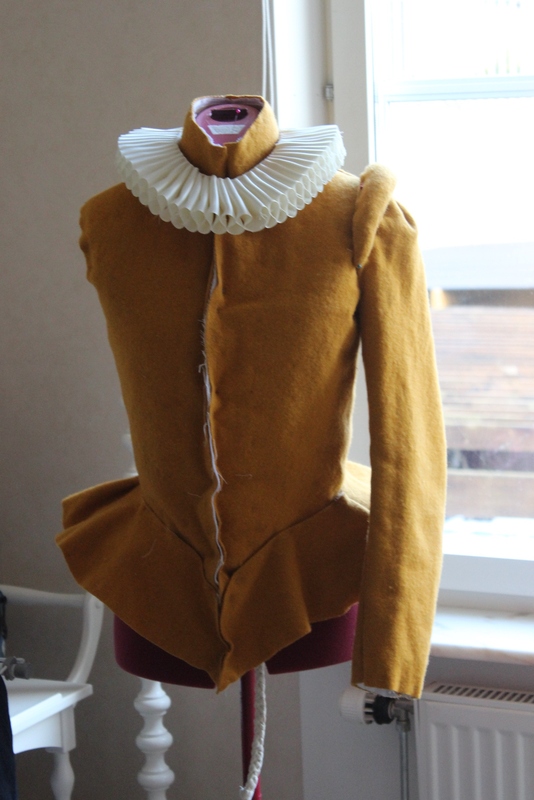 I also put the padding in the sleeves, following the instructions from “The Tudor Tailor”. 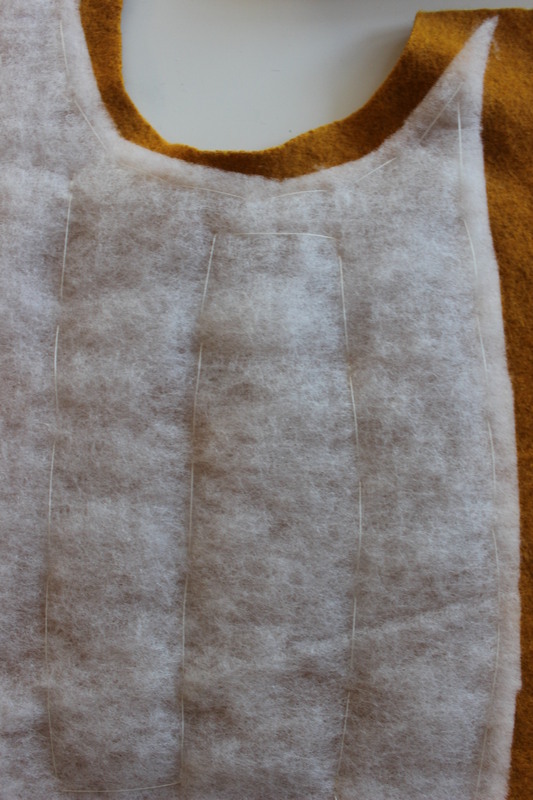 Then I started on the interlining for the bodice front. 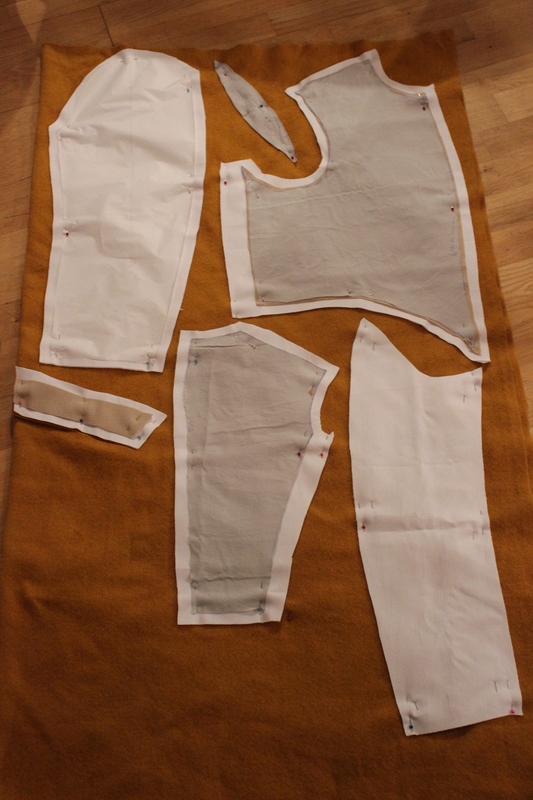 Using white cotton twill, and heavy linen to give it shape. 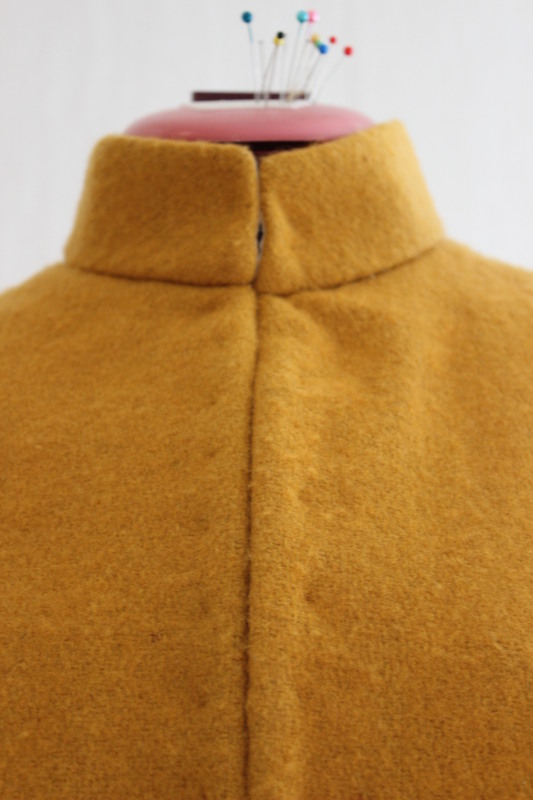 And did the same for the collar. 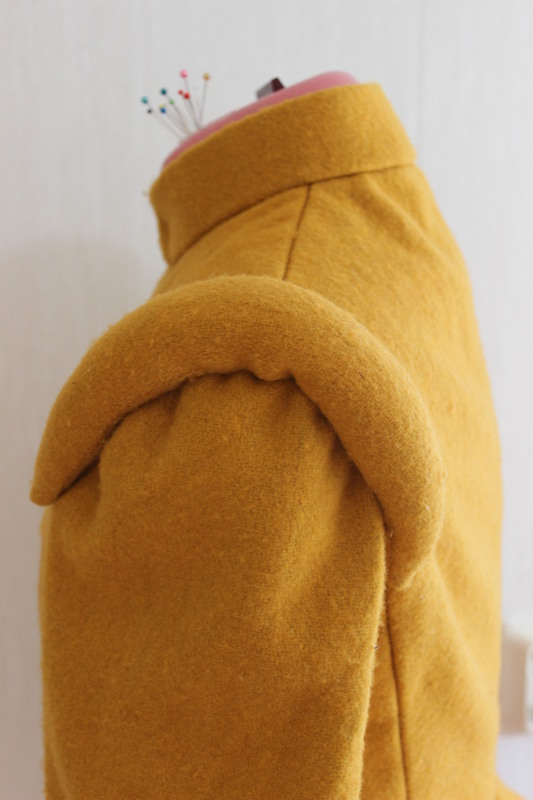 I stitched the shoulder rolls, and stuffed them with leftover padding. 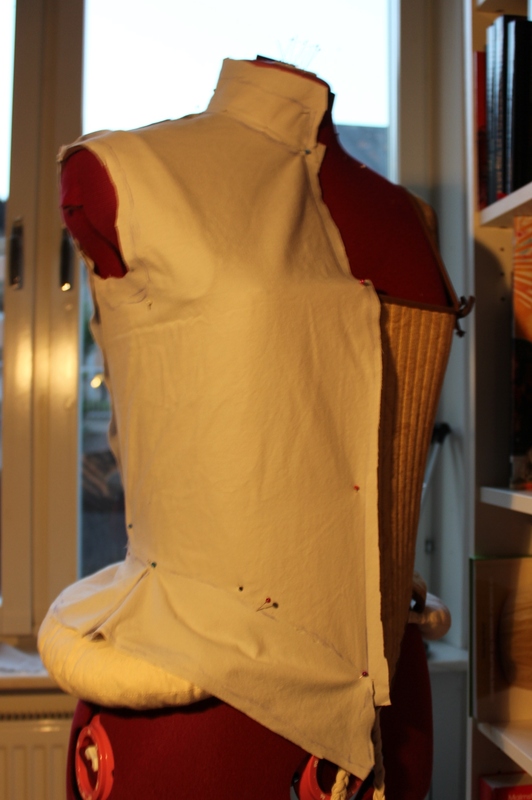 Then I basted all the pieces together, and put it on my dress form to get an idea of how it would look. Pretty nice, right. Time to try it on. Even though it fit pretty good, I felt really boxy and didn’t get the tapered look I was after. So I decided to get rid of the padding. 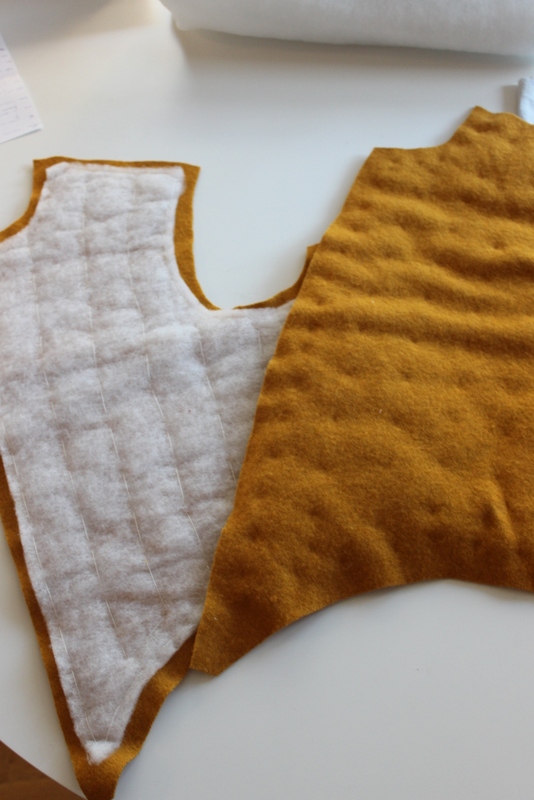 That meant taking the interlining of and unpicking all the pad-stitching on both bodice and sleeves. 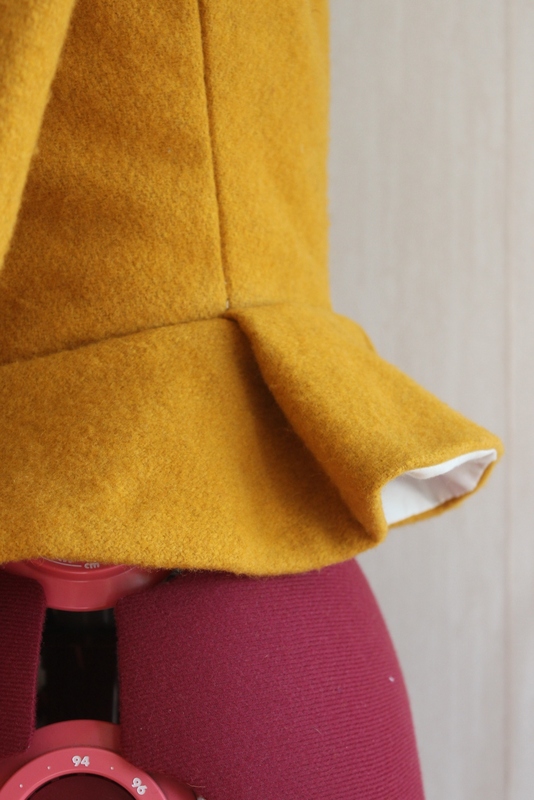 I also needed to redo the boning chanels in the interlining. After that was done everything went pretty smooth. 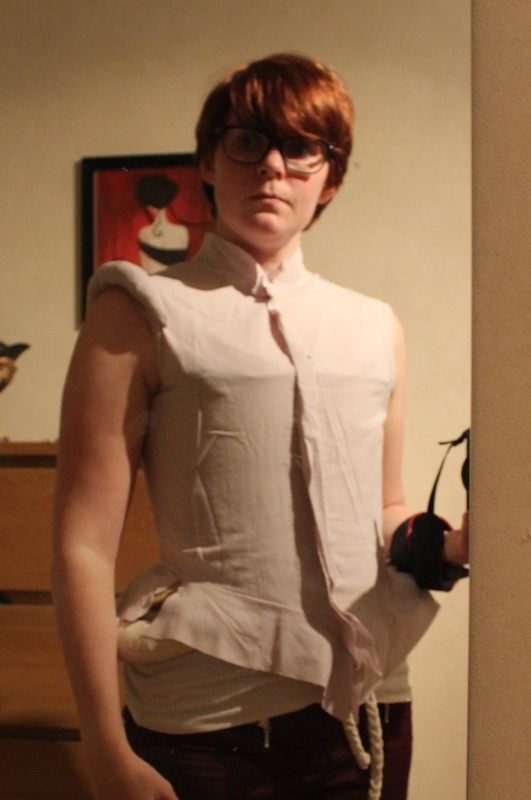 I stitched the bodice together, added the collar, the boning, put the sleeves in and attached the lining. 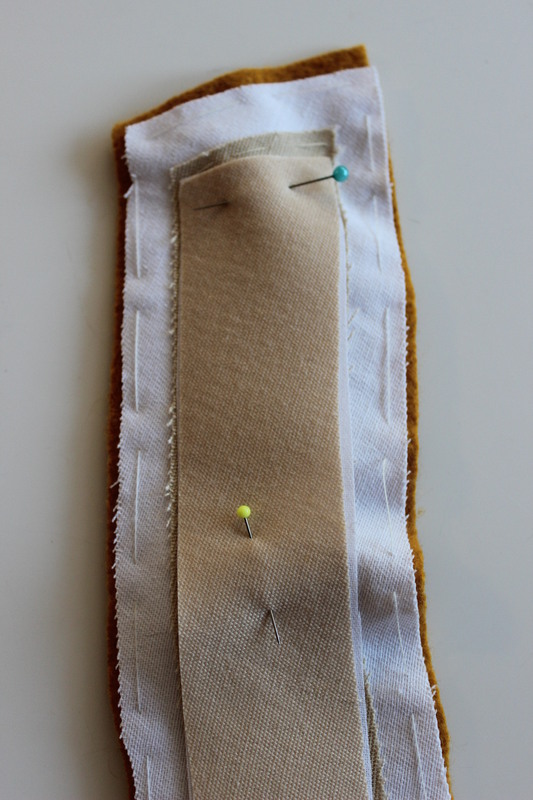 Pinning the sleeve lining to the arm hole. 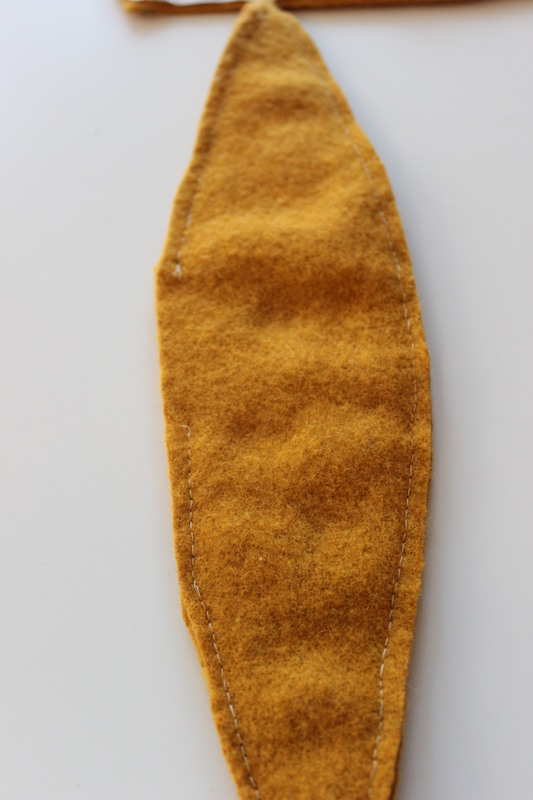 Finally I unpicked all the basting thread and stitched on the hook and eyes close to the front edge. 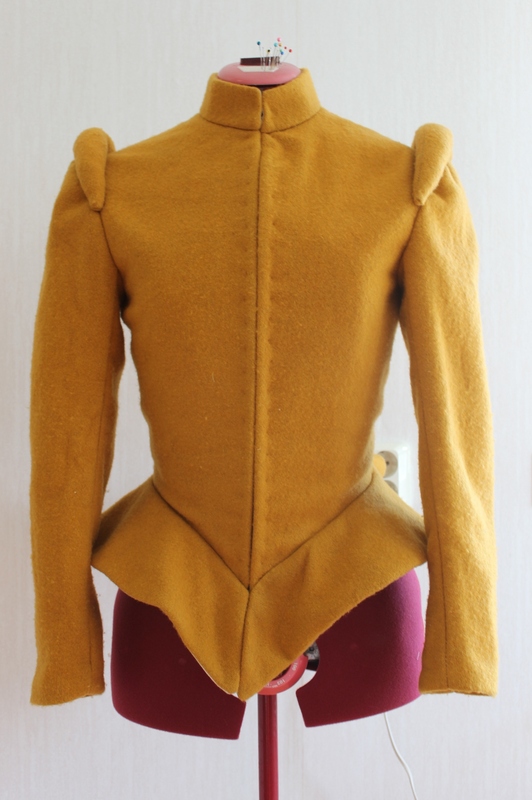 What: a 16th century women doublet. 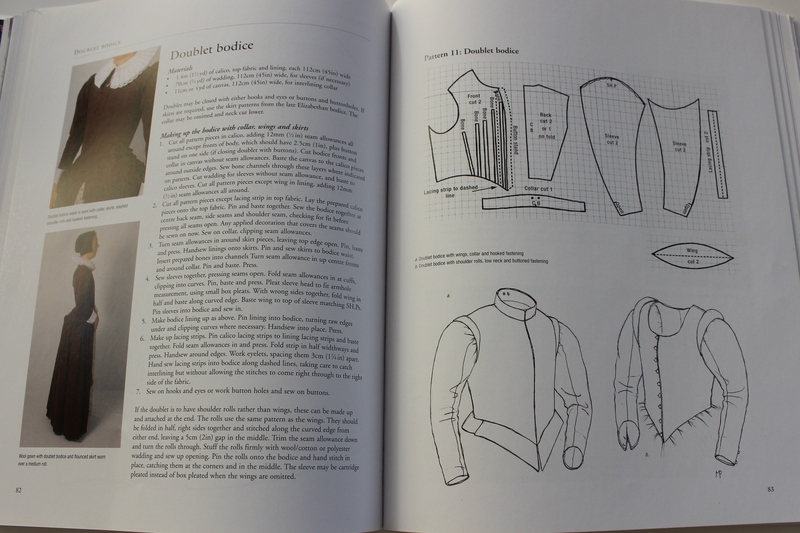 Pattern: I draped my own, using “Elizabethan Doublet pattern” from “the Tudor Tailor” as a guide. 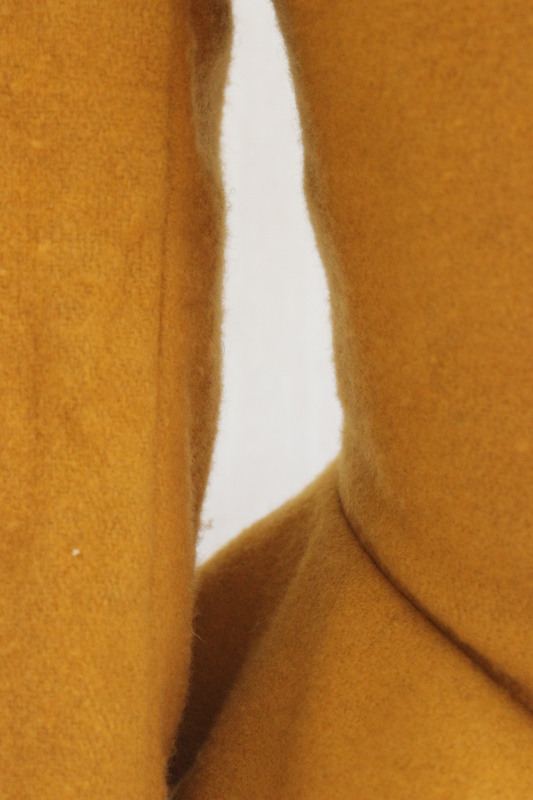 Fabric: 1, 4 m of yellow wool, 1,4 m of white cotton for lining, 1,4 of twill and 0,5 m of heavy linen for interlining. Notions: Thread, 3 m of plastic whalebone, 13 pairs of hooks and eyes. 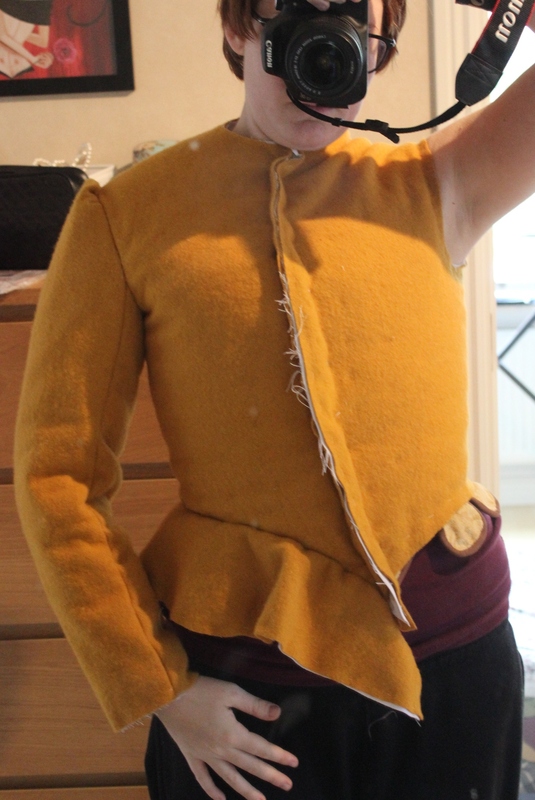 How historical accurate: So so, the look and material are kind of okey (cotton wasn’t used until later, but I didn’t had any linen to use for the lining), but the wool are pretty accurate. 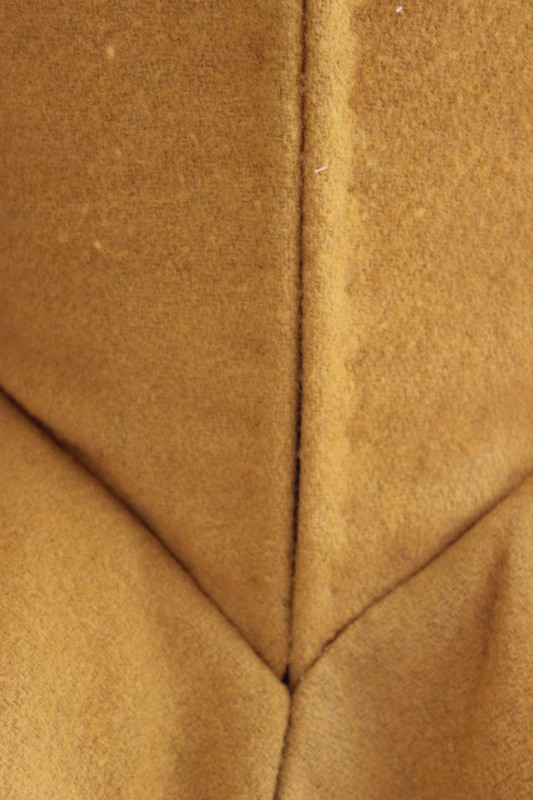 The entire garment ate hand sewn but I’m not sure about the historic techniques so I just winged it. Cost: I would say 200 Sek (32 Usd). First worn: End of September for photos. 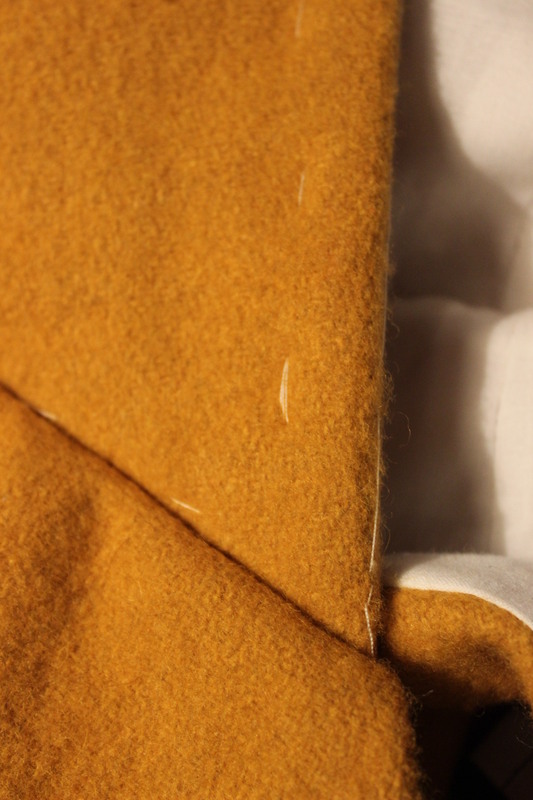 I bought it at a medieval fair a month ago, from the fabric store “Korps”. (www.korps.e-line.nu/sv). This is just fantastic! 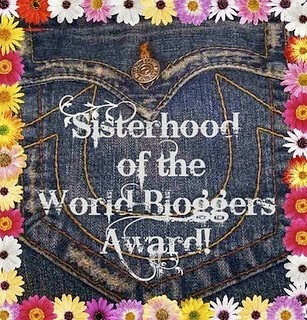 I love everything about it and want my own RIGHT NOW (failing that, I’ll just come steal yours 😉 ) And I agree that taking out the padding was a very good idea – it’s much better without!